If you’re finding yourself up to the eyeballs in the various tasks of running your business, OLB is a strategy you need to explore. 00:16 – Is this where you’re at? Hey, James here. I promised to make some videos this year. So today, I want to talk to you about the OLB strategy, which is going to help you a lot this year. So what does OLB stand for? I’ll get to that in just a minute. So the current situation that you may be in this is that you’re handling stuff like your emails, and your email broadcasts and stuff directly. Maybe you’re also editing and creating your content and then syndicating your content directly, maybe even running Facebook ads. Maybe you’re mucking around building your own website and leadpages. Maybe you’re handing customer support via inbox. If you’re doing all of these things, then you’re very, very direct. You’re going to find it hard to scale. These things don’t really scale. What I suggest you do is you go the OLB, which stands for One Layer Back. So now, you transfer all these things to somewhere else. So for example, emails and support and looking after customers should be done through a support desk. So that’s one layer back from you. You should also be dealing with a team. Your team should be building your website or an outsourced supplier. 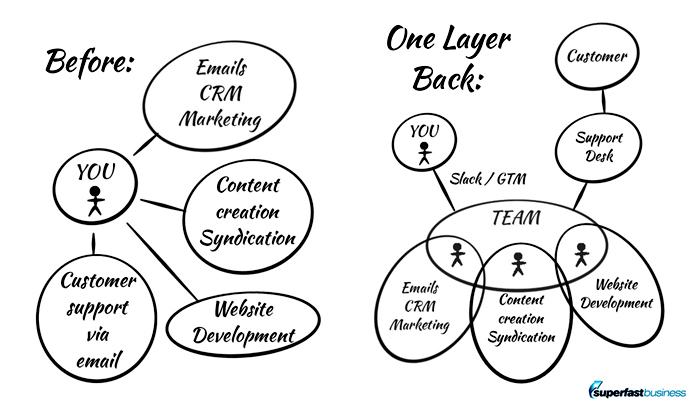 And your team should be sending email broadcasts, and your team should be editing and syndicating content. So I deal with them in Slack and in GoToMeeting. So I am one layer back. OLB – One Layer Back. So now, I can focus on the stuff that I really want to do, which is make the occasional video, do the occasional podcast, and then I give it to the team and let them do it. What does this mean? It means I can run my business from a mobile phone. I don’t need to have editing software, I don’t need to know how to use my CRM, I don’t need to know how to build a website, because the team is doing all of that stuff. I can outsource the help of a Facebook expert. I don’t need to know that either. I need to actually get rid of all of these tasks. I need to be one layer back from the action so that I can focus on the high-level stuff. So I hope you have more OLB for your year. If you enjoyed this video, let me know, so I might make you a few more. OLB! I’m so ready for this. Hope to have this full force in coming weeks. I see the OLB map and have items in place but keep getting called back to the support desk and/or project table. I really need to step back. I’m down with OLB. :) Seriously, great tips, James!